March 16 – June 16, 2013. 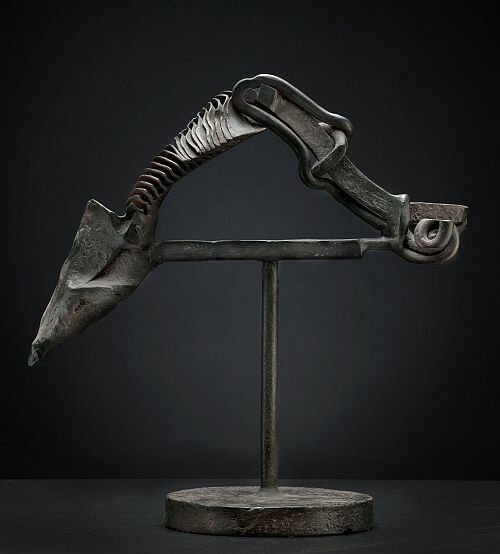 Picasso may have been the first sculptor to work in iron, and David Smith’s works may have signaled the beginning of steel sculpture, but Karl Stirner was among the first to strip metal of its suggestiveness and allow it to become purely abstract, to reveal its pure form. Transformations II: Works in Steel by Karl Stirner is on view in the Pfundt Gallery at the Michener Art Museum March 16 – June 16, 2013. Stirner, 89, brings new life to metal that has been discarded, whether from Bethlehem Steel, shipwrecks, or off the street. He fuses natural materials with manmade, and juxtaposes smooth surfaces with rough and pitted ones to form organic shapes. Stirner creates a drama of contradiction, playing thick against thin, flexible against inflexible. The German-born Stirner, who grew up in Philadelphia, was fascinated by frogs, birds, insects, crystals and shells. Watching his father work as a fine jeweler got him interested in metal, and he started his art career at age 23. An industrial designer who served in World War II, Stirner held teaching positions at Tyler School of Art at Temple University and at Moore and Swarthmore colleges, although he himself is self-taught. He operated a metal arts studio, designing and making contemporary metal furniture and ecclesiastical items, such as lighting fixtures, altar railings, architectural sculpture, ornamental panels, screens, and lamps. In 1959 he had a solo show at the Delaware Museum of Art and in 1963 showed 52 engravings at the Philadelphia Print Club. Stirner’s sculpture was put on hold as he raised a family and pursued other business interests, but the interruption fueled his drive and since 1985 more than 400 pieces have come out of his Easton, Pennsylvania, studio. His work has been shown at the Museum of Modern Art New York, Pennsylvania Academy of Fine Arts, Philadelphia Museum of Art, Corcoran Gallery of Art, La Jolla Museum of Contemporary Art, Hunterdon Art Museum, Allentown Art Museum, James A. Michener Art Museum and Grounds For Sculpture, among many others. He has been a mentor to the Easton artists community, and the Karl Stirner Arts Trail was named in his honor. “He is one of our major artists. We are lucky to have him with us,” said poet Gerald Stern.